Ralph previously served as the President and CEO of Akhiok-Kaguyak Inc. for 15 years. As the President, he directed the process that led to two successful land exchanges with the U.S. Fish and Wildlife Service. These sales and exchanges generated several millions of dollars for corporate working capital, long term investment, shareholder dividends as well as enhancing the integrity of the Kodiak National Wildlife Refuge. Ralph also served a term as the board chair of AFN and several years as a board member. Ralph was born in Akhiok, Alaska to Willie Eluska and Mary Peterson in 1945. He attended elementary school in Akhiok. He graduated from Mt. Edgecombe in 1964. He attended Fort Lewis College in Durango, Colorado and graduated in 1969 with a degree in Elementary Education. He taught elementary students, in Shiprock, New Mexico and Anchorage. 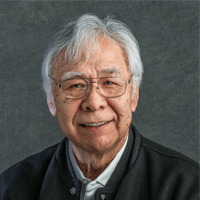 Ralph represented Alaska at the National Congress of American Indians for many years and he also represented the USA in the World Council of Indigenous Peoples. Locally he was founding board member of the Pacific Northern Academy, a private school in Anchorage.